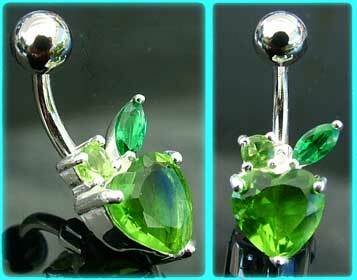 These navel bars are available with a 8mm (5/16") or 10mm (3/8") surgical steel stem. The sweet little apple design measures 6mm x 8mm, with the main part of the fruit made up by a light green stone, and a small dark green crystal representing the leaf. The best eCommerce software by ShopFactory powers P9031. All-in one eCommerce and shopping cart software.